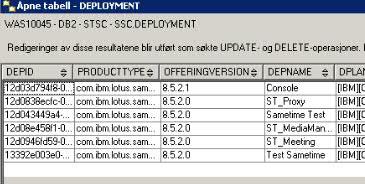 After running the IFR1 upgrade on the Sametime System Console server, the upgrade completed but with warnings. The version is still 8.5.2.0 in this table. And if you try to upgrade the Community server after this, that upgrade will fail. This means that the java process that´s trying to access the url has to be authenticated through SPNEGO in order for it to authenticate with the SSC server. But, as far as I know, there is no way of enabling this for the update-process. It might be enabled in your browser, but that does not help the update-process. So the solution is to disable SPNEGO for the SSC Deployment manager, sync the nodes and restart the SSC dmgr, SSC node and the SSC server. Voila. The SSC version number is then upgraded in the DB2 table "Deployment"
And then the Community server will upgrade aswell. Phew! the Snoop servlet is installed on the SSC server, and then the url to the Snoop servlet is used in the Sametime Connect client to get the token so that you are automatically logged in in. But is this really needed? So in my environment, I deployed the Snoop servlet on the meeting server instead. SSO is then enabled on the meeting server, proxy server and the media manager. This is sufficient. 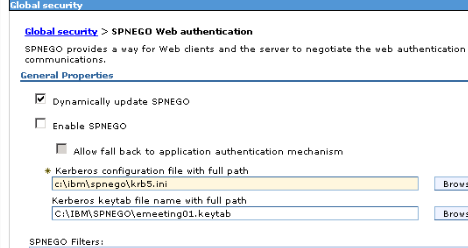 The SSC does not need to have Spnego enabled, because you can configure the ST client to use the meeting server´s snoop servlet to get the token instead.